Encaustic art is the oldest art form on earth. Dating back as far as 40,000 years in the caves of Indonesia and later in the caves of Spain and France. During the Greco roman era, 50 AD, it was used as the first medium in which portraits were rendered on funereal sarcophaguses. It pre-dates oil and acrylic mediums. Today, it is still a fairly rare art form. Encaustic comes from the Greek word “encaustikos”, which refers a utilization of heat or flame. Natural beeswax, tree sap (resin) and powdered pigment are combined to form the molten paint used in encaustic paintings. Working from approximately 40 molten pots of color, the artist has literally a few seconds to paint with the medium before it hardens. A typical painting may utilize 8 to 20 layers; each layer being fused with heat or flame. Tree resin allows the soft beeswax to harden into a more permanent and durable state. 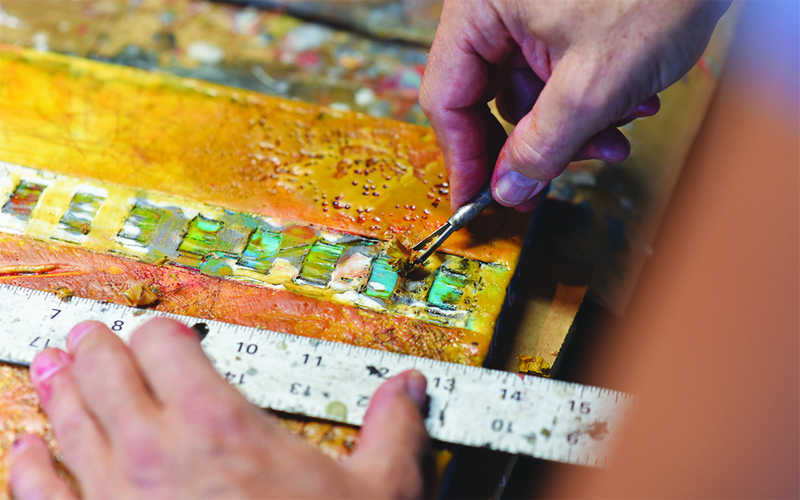 Encaustic medium also allows an amazing luminescence in a painting as light enters the surface of the wax and bounces off the back of the painting, then projects back to the viewer’s eye. A transparency can be achieved with wax that is not available in oil or acrylic painting. Each piece has a soft patina on the sculptural surface. It is a totally organic and natural art form.